If they succeed, it would have major implications for quantum computing. For years, physicists have worked towards the ability to directly measure Berry curvature. Often discussed as a “holy grail,” this observation has seemed impossible to make until now. Berry curvature is associated with “Berry phase,” also known as a geometric phase, which is a phase angle. It “describes the global phase evolution of a complex vector as it is carried around a path in its vector space,” according to Rutgers. Berry curvature isn’t widely popular or well-known, but it is a major unifying principle in both quantum and classical physics. This quantum mechanical property governs the dynamics of the motion of charges in semiconducting solids. UC Santa Barbara physicists appear to have, in a world’s first, opened up the possibility of directly observing Berry curvature in solid matter. 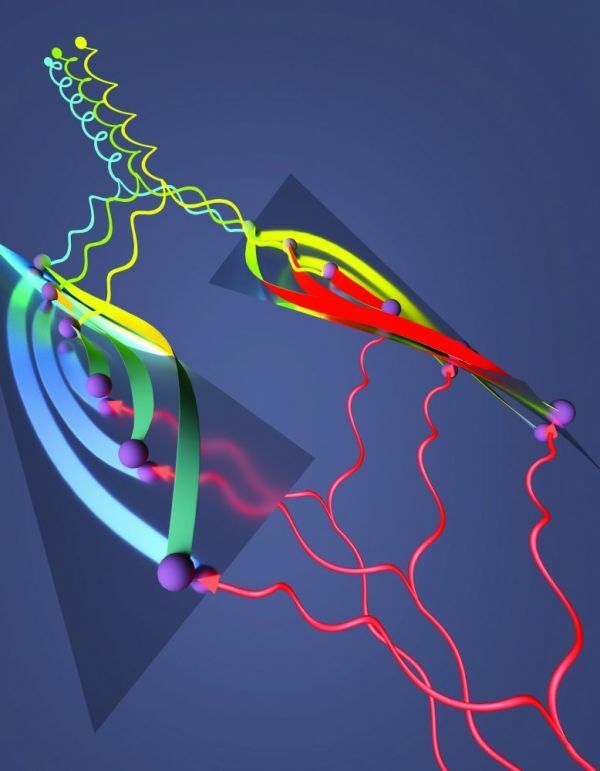 Published in the journal Physical Review X, their new paper uses a previous UCSB paper, in which the researchers aimed high- and low-frequency lasers at a gallium arsenide semiconductor to create an electron-hole recollision, as a stepping stone. In conducting research for the new paper, physicists from CSB’s Sherwin Group worked with fellow scientists from China, Princeton University, and the U.S. Naval Research Laboratory. With the goal of improving the previous experiment, they discovered dynamical birefringence, a new phenomenon that can be used to explore Berry curvature. “When we originally did the experiment, we could only detect one sideband at a time and the samples were very fragile and more difficult to work with,” said Mark Sherwin, physics professor and director of UCSB’s Institute for Terahertz Science and Technology. By installing a highly sensitive camera to simultaneously capture all the sidebands, improving how samples were mounted, and increasing the strength of the applied terahertz electric field, this team opened up the possibility of observing the property. Because the team could see more sidebands, they could discover more about the semiconductor. “We’re planning to turn dynamical birefringence into a direct measurement of Berry curvature,” Sherwin said. This experimentation could lead to applications in electronic and optical devices, quantum computing, and more. “Once you can measure something that’s a basic property of a solid, then, when you’re designing new materials, you can optimize the Berry curvature for a particular device,” said Sherwin.